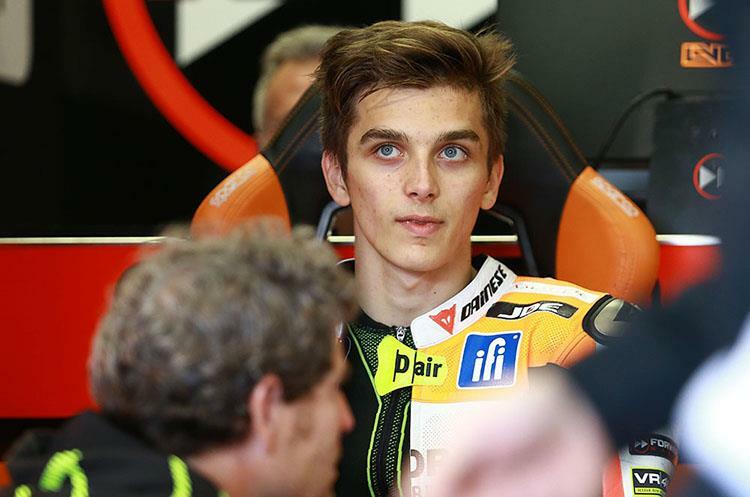 ﻿ Moto2: Who the hell is Luca Marini? It’s not always the step up in racing to be a member of one of the famous dynasties of the sport like a Dunlop or a Haslam… so imagine how it must feel to be the half brother of one Mr Valentino Rossi! MCN caught up with Forward Racing’s Luca Marini, to talk to the Italian about his favourite things about motorbike racing, the sacrifices he’s made, and of course his famous family. How did you get into racing and what was your first bike? When I was very young, I always went to see racing across the world with my brother. But the real reason I started racing is that one day I saw a track and some children riding minibikes – and I wanted to try it. From there I started my travel into this world. I think my first bike was a ZSP minibike, that I started on when I was four years old and that I really enjoyed riding. I’m very sad that I don’t still have it! What’s the reason for your number and your helmet design? My real number was 97, because I was born in 1997, but this year I have to use the number 10 because 97 is occupied by other riders. I chose 10 instead because I love football, and it’s very important in football; it’s the number of Francesco Totti, my idol from AS Roma. I always wanted to find some design with a lot of colours for my helmet, with a lot of fluoro, and with a lot of orange because it’s my favourite colour. With Aldo Drudi, the designer of my brother, we try to find something new every year, something innovative, and try to do something colourful! What sacrifices have you made for racing? I think that all riders make sacrifices to go racing. Sometimes, I was helped by my brother, because being Valentino Rossi’s brother is a help, but I’ve still made a lot of sacrifices and I will still have to in the future to do well. The speed. The speed is to me something particular that I love. The first Grand Prix in Qatar was nice, but the thing that has made me most proud was that my ideal lap in Mugello this year was better than every other rider. In qualifying, in the last corners I was disturbed by some riders and couldn’t do more – but on paper my ideal lap was the first. I’m very happy about that, and kept the lap chart in my room! The biggest challenge for me is to get away from the name of being Valentino Rossi’s brother. I don’t want to get rid of it, because he is a part of me, but sometimes I want to be Luca Marini, not only his brother. Could you change the rear wheel on their bike? I think yes, but it’s very difficult! I have to say that in the paddock, there are not a lot of funny stories, because a lot of riders are quite serious. There are some though – my friends Antonelli, Migno and I sometimes crash in the paddock on scooters, and when I see them on Thursday with new bruises or scrapes I normally smile! Which race bike of the past would they like to ride? A 500GP for sure, the Honda that my brother used in 2001. It was a great bike, and I would love to know what it felt like to ride it. What did your teachers say when you said you’re going to race in GP? My teachers helped me in my five years of high school. Some were a little bit angry, because I missed some tests being away, but in the end they were proud of me. Which racer do you aspire to? 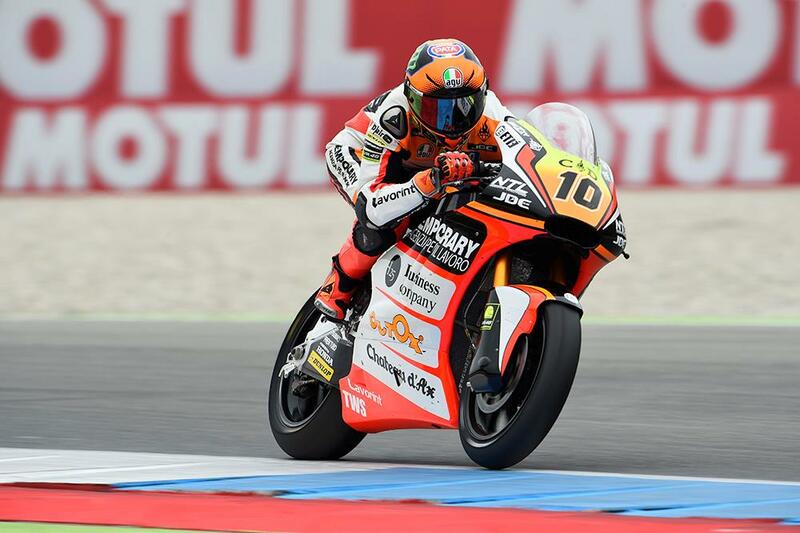 Forward Racing has confirmed that Luca Marini will join the team for next year’s Moto2 campaign.